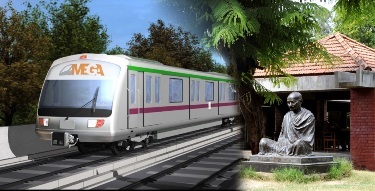 Ahmedabad : Residents, facing displacement due to a proposed metro rail project here, today rejected the relocation offer made by Metro-Link Express for Gandhinagar and Ahmedabad (MEGA) Co. Ltd. before the Gujarat High Court, arguing that the area in question is “communally-disturbed”. The 22 petitioners, who own houses and shops in Jivraj Park Society, have instead demanded relocation to the plots available in Prahladnagar or Manekbaug areas of the city. The matter was heard by the division bench of Justice Akil Kureshi and Z K Saiyed. MEGA had made an offer to the project affected residents to relocate to a plot bordering Vejalpur and Juhapura. However, they opposed the proposal stating that the area was communally disturbed and was among the first to be affected in the event of communal riots. The residents said they are willing to shift to either of the two areas– Prahladnagar or Manekbaug– which they have suggested, if offered relocation there. MEGA said it would think of the option offered by them. Respondent Anil Gupta, General Manager (Planning) of MEGA, had earlier stated that the company will go ahead to acquire the land if the petitioners agreed to be relocated to the area. The petitioners, including residents and shopowners of Mangal Deep and Vishwakarma Residential Societies of Jivraj Park area from where the north-south elevated corridor of the proposed metro rail starts, had moved the high court, alleging that acquisition of their properties by MEGA was not in accordance with Land Acquisition Act of 2013. They had claimed that they would lose their houses and shops due to the project and state-owned MEGA, undertaking the project of Metro Rail, is not ready to provide anything beyond cash compensation against the acquisition of their properties, which is a violation of the Act. The next hearing on the matter is scheduled on April 12.